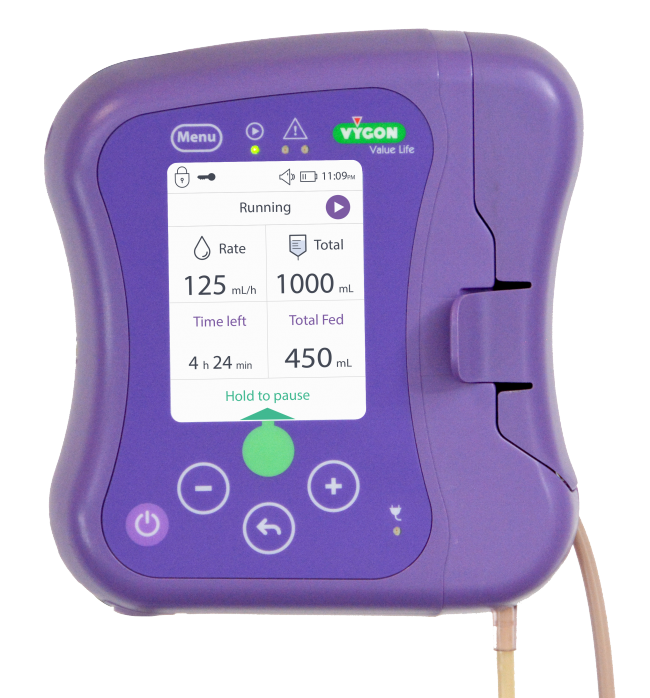 Ecouen, France – Vygon, the single-use medical devices group, announces today the launch of easymoov6, a more intuitive enteral feeding pump. Connected via a tube to a nutrient bag and equipped with a digital interface, the pump supports the management of enteral feeding in both hospital and homecare. Using the pump, the medical team can administer and accurately control the flow rate and the amount of food delivered, monitoring the patient’s enteral feeding by using information on the amount already administered and the time remaining until feeding is complete. Easymoov6 addresses a major issue facing medical staff: keeping patients’ weight stable. Some chronic conditions, gastrointestinal surgical procedures and localized cancers (of the tongue, mouth or esophagus) can lead to weight loss as the patient is unable to feed themselves, has no appetite, etc. Patients may sometimes become malnourished. This can affect the efficacy or prevent the continuation of some therapies. In general, patients with cancer have an increased need for nutrients in order to fight the disease. To maintain or re-establish proper nutrition and prevent patients from becoming dehydrated or malnourished, healthcare practitioners may decide to supplement or replace oral feeding with enteral feeding (the delivery of nutrients via an enteral probe). 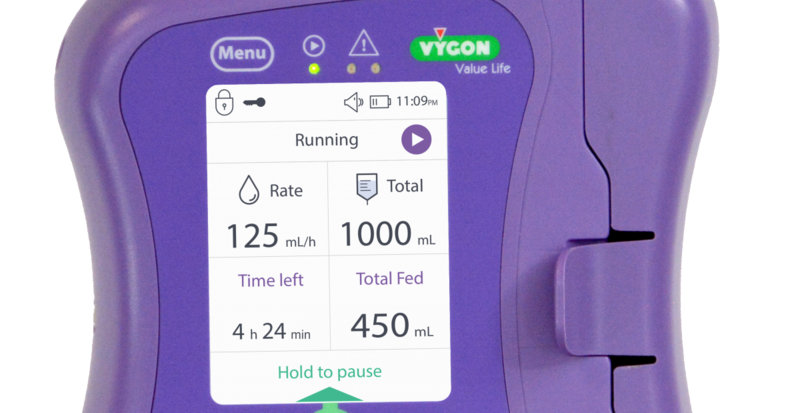 Vygon’s easymoov6 pump is designed to optimize enteral feeding. The device obtained CE marking in October 2016. It provides an intuitive digital interface, available in several languages, which displays all the information required to monitor feeding, such as the time remaining until feeding is complete and the volume already delivered since system activation. Using this device, the medical team can precisely administer nutrition, adjust the flow and volume, and monitor the patient’s enteral feeding. An infrared and ultrasound detection system alerts hospital staff to the start and end of feeding and reports any malfunction (via yellow or red LEDs, depending on the nature and urgency of the issue). Easymoov6’s distinctive features include a continuous peristaltic motor and a single screen that provides information on the programmed settings. It is consistent with current technologies increasing safety of use with a single color screen displaying all the information. Suitable for use in hospital and in the home, the device is intended to prevent the problems often associated with this type of product such as alarms and obstructions. The alarm screens are specifically designed to guide the patient straight to the area where corrective action is needed. The rounded design of the pump makes it easy to clean and disinfect. Powerful yet quiet, the continuous peristaltic motor in easymoov6 prevents food from obstructing the pump set. With no rhythmic noise to disturb patients’ sleep, enteral feeding can be administered at night. Enteral feeding needs are increasing year-on-year in response to population aging and the growth of homecare. The market for enteral feeding is growing by 6% a year. Pumps account for over 60% of sales in enteral feeding. Vygon designs, manufactures and markets high-tech single-use medical devices for healthcare professionals in hospital and for private and independent practitioners. Vygon is a world leader within this industry, offering a wide range of products in a number of clinical specialties: neonatology, adult and pediatric critical care, anesthesia, long-term vascular access, oncology, emergency, cardiovascular and surgery, and home care. With expertise right along the value chain, from product design to the delivery of training for medical personnel, Vygon provides health care professionals with effective and innovative products tailored to their needs and those of their patients, for optimum use and safety. The company distributes over 205 million products a year in more than 120 countries through its network of 27 subsidiaries and 331 distributors. Vygon products display the CE and/or FDA mark and are manufactured in the group’s eight factories in Europe, the USA and Colombia. A family company founded in 1962, Vygon is based in Ecouen, in France’s Greater Paris region. It is a mid-sized business employing 2,150 staff worldwide. The turnover in 2015 was €302 million ($328.6 million), with 81% of this derived from Vygon’s international business.